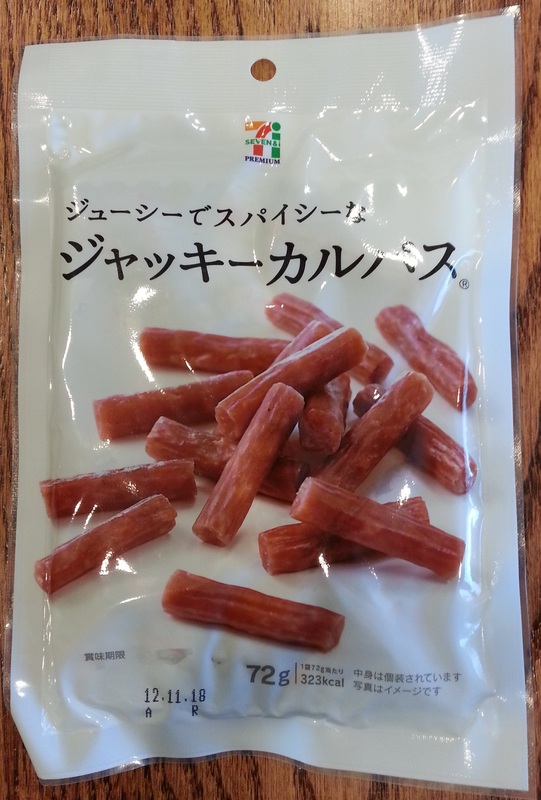 Today we’re dipping our toe back into the international jerky scene with a package of Seven Premium Dried Sausages from a Seven & i 7-eleven store in Tokyo, Japan. Taste (B+): This is a deliciously savory sausage with a mild flavor with strong hints of garlic and a slight touch of pepper. It tastes like a pork-based sausage, maybe with a bit of chicken mixed in. Not at all spicy, it is instead almost sweet, and you quickly find yourself reaching for the next bite. This tastes like a very simple recipe and does not seem to have a lot of the preservatives you’d typically find in shelf-stable meats. Texture (B+): These sticks are tender, but dry and not at all greasy. Their casing is thin and unobtrusive and barely registers as you eat a stick. The meat inside is thoroughly ground and chews nicely with each bite. This is a nicely made stick that feels good in your mouth. Smell (B): There’s a slightly smoky sweet scent to these sticks, with a bit of that garlic and pepper coming through. The smell is not very pronounced but compliments this treat very nicely. Appearance (A): First, each stick in this package is individually wrapped. Seriously. To my American eyes they look almost like little candy treats, each end of the clear plastic sheet twisted to keep the wrapper closed. Remarkable. This extra bit of TLC seems to have done a remarkable job in keeping each piece of sausage looking its best. The pieces are a light brown color, with spots of even lighter color visible throughout, and the ends of each piece are uniformly cut. There’s an air of precision, for lack of a better word, conveyed by this meaty treat. The wrappers are printed with “Jackie Calpas” which, with a bit of online searching, appears to be the manufacturer providing these sausages for 7-eleven in Japan. More than a novelty, this just looks fantastic inside the wrapper and out. Consistency (A): The sausages themselves are made of a fantastically well-blended meat that is uniformly moist and tasty throughout the entire bag. The moisture of these sticks is exceptionally well maintained and their flavor, too, is simply expertly applied. These sausages are the product of serious attention to detail and it shows in every bite. Overall Impression (B+): What a treat! While we’re still not quite sure what it is we actually just ate we are 100% sure it was delicious. Given that these are a convenience store brand, these Dried Sausages are a diamond in the rough and that they’re individually wrapped is just a hoot! If you’re in Japan and your meat tooth starts itching you can definitely get some satisfaction with this fantastic snack. Eat well!